Bats don't just hang in the rafters, now they hang around your neck! 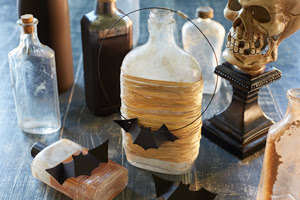 Halloween gets all dressed up with this bat-tastic necklace project created by Hallmark. Not only is it 'spooker' easy, but there are easy template directions in a printable form for you to follow. Send the bat through your Cut n' Boss with an embossing folder to add texture or use your eBrush to spray some fancy gold or silver to the wings.